The design of his helmet is based on the toy version of the Crystal Castle, while his staff is a depiction of the cartoon version. The double crests on his robe are loosely patterned off of the upper windows of the Crystal Castle toy, and the colors of the robe are based on the toy's flag. His breastplate, belt, and boots are based on the Bow action figure--not because he has any connection with Bow directly, but because if there had been a Light Hope action figure, it's likely that Bow's token male sculpt would have been harvested for parts. The symbol on his chest is the same sun-symbol motif found on She-Ra's, and his wings of light echo the double wings of the cartoon version of the Crystal Castle. His sword of light is based on a She-Ra role play set which differs from other depictions of She-Ra's sword. PROFILE: LIGHT HOPE is a master sorcerer and expert warrior. He wields a sword of light and the staff of the Crystal Castle. His wings of light provide him with flight as well as a defensive barrier. Light Hope's even-handed wisdom is reknowned throughout the cosmos. HISTORY: The power embodied by the Crystal Castle of Etheria is ancient, and, like Castle Grayskull on Eternia, predates recorded history. 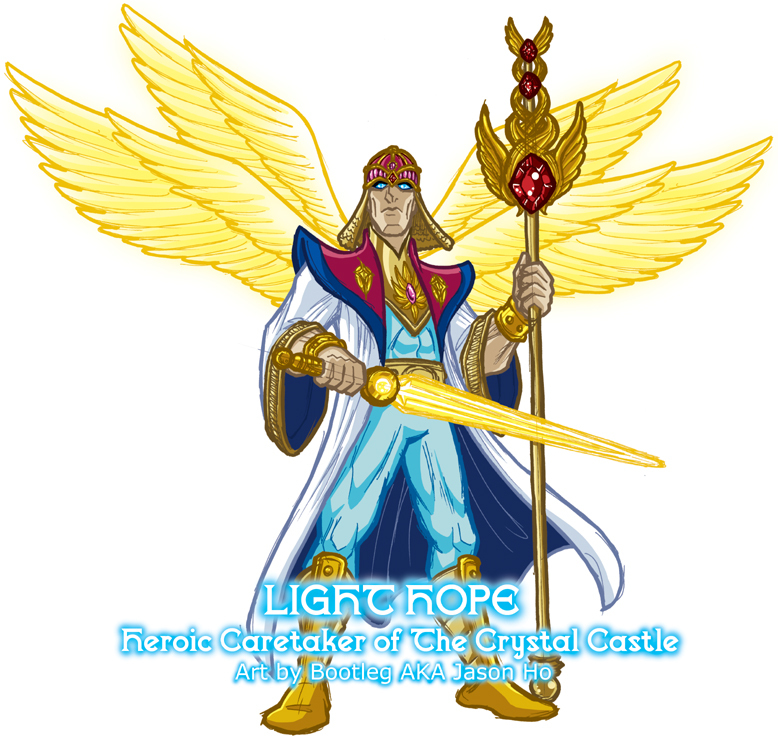 Light Hope--a powerful warrior-mage rumored to be allies with He-Ro the Wizard and King Grayskull--sacrificed his mortal body to become the caretaker of the mysteries of the Crystal Castle. It is foretold that Light Hope will take on his human form once more in Etheria's greatest hour of need. You didn't think I'd go without stating this looks like Led, did you? Haha, of course I'm just kidding. Led's on my mind a lot since I got the site and the latest e-zine done.